This last week has been one of big conversations about tiny homes. Mainly due to the exciting ‘Freo Alternative’ planning scheme signed off in state government last month. Initiated in 2014 by the Australian Urban Design Research Centre, and collaborated on with local architects, the brief was to come up with an intelligent way to densify Fremantle without losing the characteristics or lifestyle that make the area and surrounds so pleasing to live in. Five years later, following a huge community consultation process, some big ideas and a lot of push from local government, it’s finally come through. For people living in White Gum Valley, Hilton, O'Connor, Beaconsfield and Fremantle, there will now be options to build tiny homes on suitable property spaces. This positive development should encourage a diversity of housing to reflect the suburbs themselves, made up not just of traditional houses and townhouses, but dwellings that will also be suitable for the elderly, students, singles, and small families. “At the heart of the Freo Alternative is housing that is smaller, more sustainable and surrounded by open, green space. You could say this is housing that better meets the needs of residents in the 21st century.” says Mayor, Brad Pettit. These kind of wins are really exciting for us to see as it creates more opportunity in a tough housing market. Swampscapes is an exhibition presenting a reorientation to Perth’s richly diverse and critically important rivers, streams and wetlands—both current and historical—many of which are sacred in the stories and culture of the Whadjuk Nyungar people. Swampscapes is a collaboration between Daniel Jan Martin, Nandi Chinna and Mei Swan Lim (of Swamp Clubb), working across their respective fields of cartography, poetry and soundscape. Jennifer Sulaj’s Lost Memory is a sculptural exploration which comments on her experience as an art therapist working with people living with dementia. In Guy Vinciguerra’s photographic works, Sacred Places, he explores the idea of the sacred things we glimpse in passing, things that are imbued with emotional importance to some, but nothing to others as they speed past confident as to their own journey and oblivious to the trauma of what has passed at these places before. Jovin Lim, founder of Jovin Lim Modelmakers, will be hosting a class for anyone who is keen to learn the skill of modelmaking – architects, interior designers, landscapers. You will have a chance to build your own model from start to finish, and also to bring along your own projects to ask questions of Jim after the workshop. $15 for students, $25 general admission. Tickets here. National happening… If you’re heading to Melbourne, Melbourne Design Week begins tomorrow (14th) until the 24th of March and there is an unbelievable amount of amazing things to connect with. Check out the program here. + All this talk of tiny homes reminded me of a series I undertook while working at architectural mag, Assemble Papers, in 2014-2015. 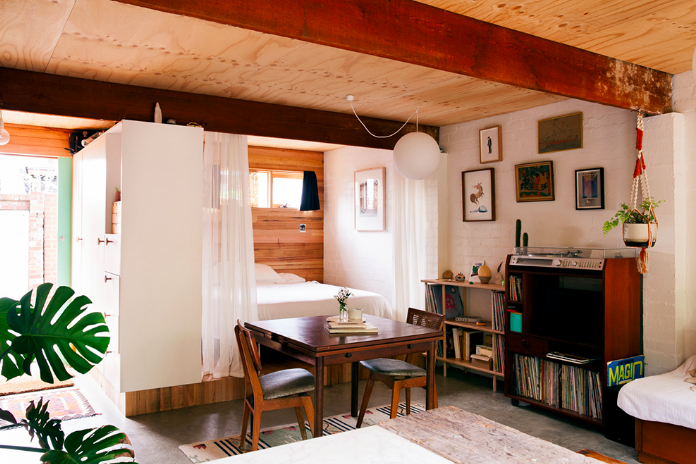 It was on Backyard Bungalows, beaut little spaces crafted for habitation in the garages, back blocks or gardens of homes around inner-city Melbourne. Here are three of my favourite. The first is owned by Alex Kennedy and was built in collaboration with Sarah Trotter of Hearth Studio, the second is by architect Murray Barker, the third is by Emilio Fuscaldo (of Nest Architects) and his wife, writer Anna Krien. Get inspired. + Mathieu Tremblin no doubt infuriates the local graffiti community while translating tags into a more palatable format for the uninitiated. + If you’re looking for recipes for the seasonal change and love a flavour, check out the websites of two of our favourite Australian chefs. The first is Ella Mittas of Ela Melbourne, whose fresh Greek food is second-to-none, the other is Julia Ostro, who dishes up the most perfect pasta and Italian cakes.